Want to save money and save the environment? IUE-CWA can help. J.P. Davis, General Manager, CG Power Systems USA Inc. Through a unique partnership with the Environmental Defense Fund (EDF), IUE-CWA has developed a program to teach hourly workers and management how easy it is to identify and implement energy saving opportunities in manufacturing facilities. Over a three-day workshop, IUE-CWA’s experienced local union team leaders will increase awareness and enthusiasm about energy efficiency through powerpoint presentations and hands-on exercises. Starting on a Sunday, we look at a plant during shutdown and then the next two days in full operation with teams focusing on building systems and the production process. We then work together to develop recommendations on ways to minimize waste and quantify what the savings would be. Harnessing the knowledge and experience of the workforce is a key factor in making energy projects work. Those who run the machines know best how and where to save money. They just need to become aware of the potential. The IUE-CWA Treasure Hunt program has identified annual energy savings ranging from $50,000 to $180,000 at the locations we have visited. All for a three-day workshop provided at no cost to our employers! Wouldn’t you like to become more competitive at your facility? 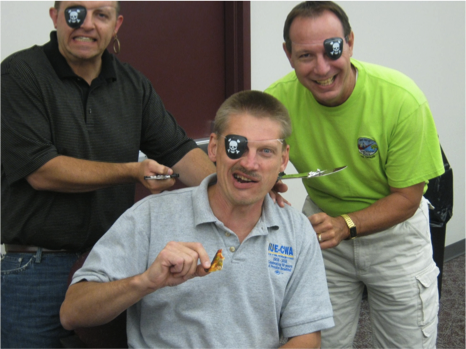 Treasure Hunt team members take the name – and project – seriously.